Emergency workers rescued hundreds of trapped people Monday as water swallowed swaths of central England in the worst flooding to hit the country in 60 years. Officials said some rivers were still rising. It's been a freakishly wet summer in England, reports CBS News correspondent Elizabeth Palmer. Last month, the north of England was under water. Now it's the south. When a month's worth of rain fell in a single hour last Friday, it submerged large areas around the Severn, the Avon and now the Thames River, which have swollen to dangerous levels, adds Palmer. Insurance companies say the damage could reach $4 billion. "This emergency is far from over, and further flooding is extremely likely," Environment Secretary Hilary Benn told lawmakers in the House of Commons. "People look at me and say I look fine, but inside I'm all churned up," said Sylvia Williams, a 69-year-old widow among the evacuees. The stadium was stocked with blankets, food and bedding for up to 1,500 people in case the Thames burst its banks. Flood defenses in the center of the town — home to the renowned 800-year-old university — were holding so far, but Thames water levels were not expected to peak until midnight. Among the hardest-hit areas was the medieval market town of Tewkesbury, 110 miles northwest of London, where the cathedral and a few blocks of nearby houses stood like an atoll in a vast stretch of muddy water that stood five feet deep in places. "It was just devastation — total chaos, cars floating past, rubbish, all kinds," said John King, a 68-year-old retired firefighter from Tewkesbury. "You just can't stop water of that power. He said he saw goldfish swimming in his driveway. Some residents lined up for free water at local grocery stores, while others took to canoes and small boats to ferry food and water to housebound residents. The last time Britain saw similar flooding was in 1947, according to the Environment Agency. No deaths or serious injuries have been reported in the current flooding. The Severn Trent Water company said at least 350,000 homes in Gloucestershire, in western England, were without water after flooding shut down a water treatment plant. The Ministry of Defense said water was being cleared after flooding at a nuclear weapons-manufacturing site at Burghfield, about 40 miles west of London. Officials said there was no risk of a radiation leak. London itself was not affected. The city is protected from flooding in the east by the Thames Barrier, the world's largest moveable flood defense, which closes to seal off part of the upper Thames from the sea. To the west, London is protected by several flood defense measures — including the Jubilee River, a 7-mile-long diversion channel. The western section of the Thames that officials worried about lies 80 miles from the capital. "It is pretty clear that some of the 19th-century structures and infrastructure and where they were sited is something we will have to review," said Brown, who succeeded Tony Blair less than a month ago. Much of Britain's infrastructure dates to Victorian times. The British weather was consistent with conditions caused by the La Nina weather system, which is caused by cooling ocean waters and leads to extreme weather, Britain's Meteorology Office said. However, scientists said there was no clear explanation for the unusually long spell of wet weather. "The situation is looking critical at the moment. 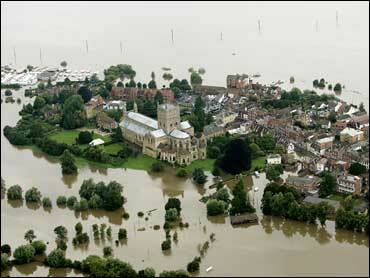 Unfortunately the misery is set to continue," said Environment Agency spokesman Joe Giacomelli. Climate change may be culprit, said Tim Evans of the Chartered Institution of Water and Environment Management, adding that the situation matched predictions of how global warning would affect Britain. Britain had one of its hottest and driest summers on record last year. "What we now think of as extreme events will occur more often than in the past, and the extremes will get more extreme," Evans said.